Photo courtesy of Todd Grant. It’s always best to come before the peak period. I thought it said PMT. I’m an up and coming bloke. Ironic that the sign is missing a period. @Marum | 4:17 am: Same thing, isn’t it? It’s about to have it. The “p” = pre. Every rose may have its thorn. But this seems like a right pack of pricks. 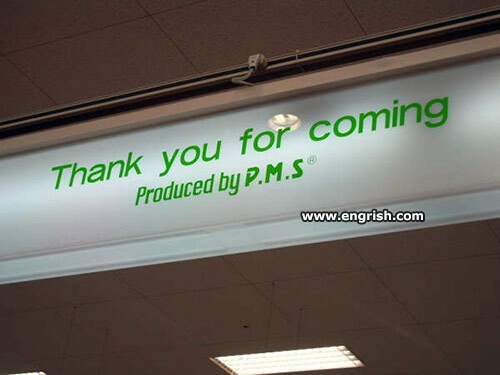 PMS® ? Now there’s an idea, ladies! Maybe if you let the registration lapse, the government will take it away. @Yu No Hoo | 4:22 am: Maybe the sign is pregnant with meaning. I opened a door for one of the feminist lesbian (ladies?) at one of the Unis one day. Well. She went absolutely friggin’ ballistic. If you think the realization that, “she had been had” improved her temperament. You would indeed be living in a Fool’s Paradise. I notice German has not yet succumbed to this; “non-sexist speak rubbish”. The ship is sinking – PERSON THE LIFEBOATS. – Dear? Where’s my P.M.S? … and not changing your mind. And on the PA system, songs from the Rolling Stones album “Let It Bleed” are continually played.